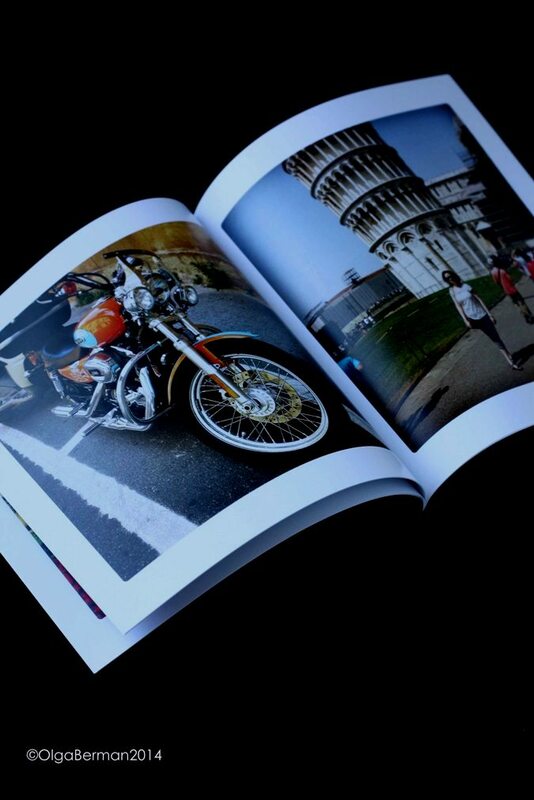 A few weeks ago I got a chance to create a book of 20 instagram photos. This was so easy! First, I downloaded Mosaic app on my phone. Then I chose 20 of my instagram photos. 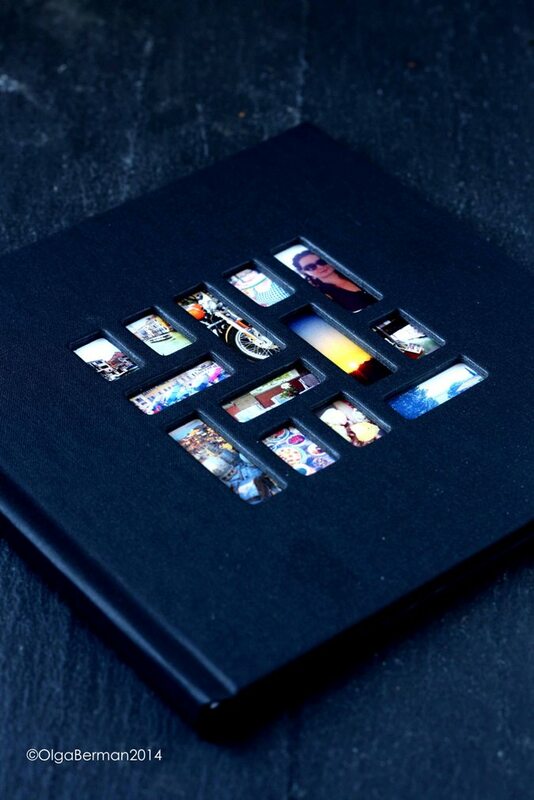 Then the book was delivered to my door in four days!! I chose some of the photos from my trip to Italy this past June. Disclaimer: Mosaic provided a code for me to create a book for FREE and is letting one of my readers win a free book of their own!!! I was not compensated for this post. Scroll down for the giveaway! 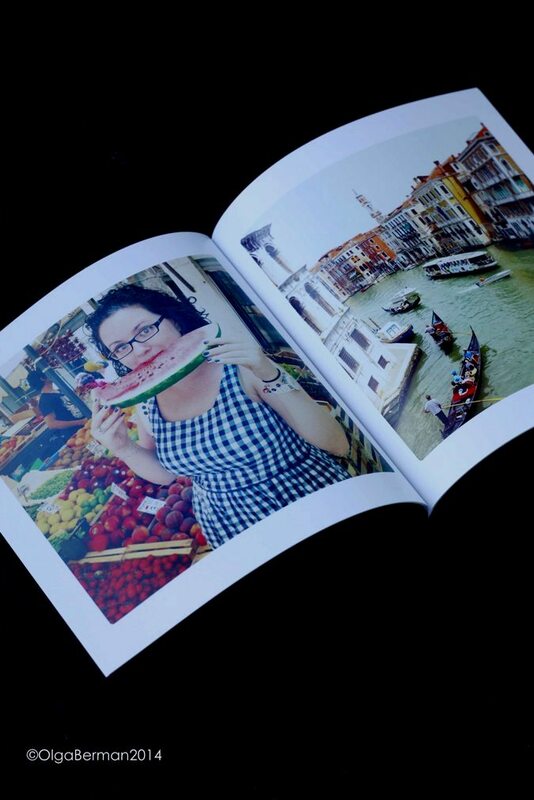 Back in June I wrote about a culinary cooking vacation I took last year with my friend Cecilia. We flew to GREECE to attend a culinary program on the island of Kea: Kea Artisanal. It was a wonderful experience: we learned a lot, drank quite a bit of Greek wine, made our own olive oil and met wonderful people. Well, guess who's in town!? 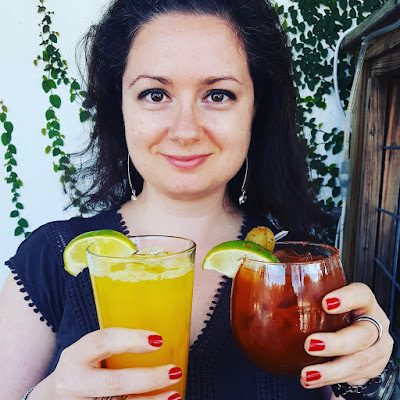 One of the owners of the Kea Artisanal: Aglaia Kremezi. 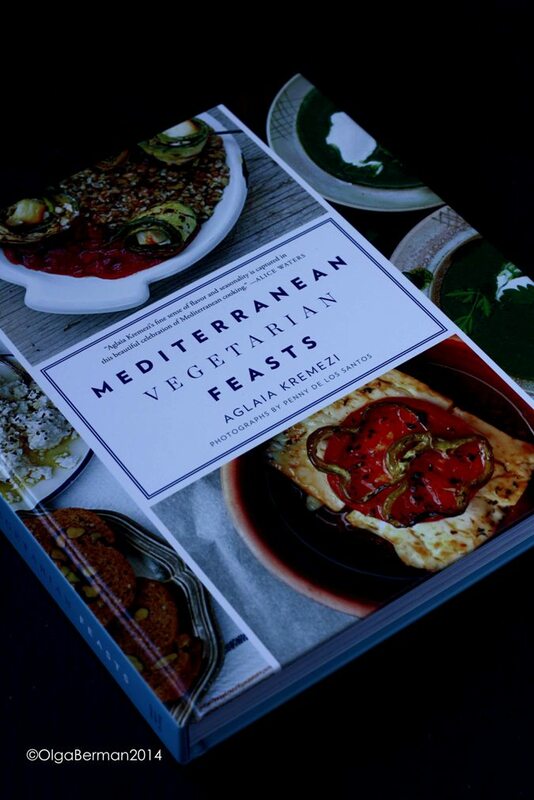 Aglaia is on a book tour in the US promoting her newly published Mediterranean Vegetarian Feasts cookbook. I received a preview copy of the book and also had a chance to have a Q&A with Aglaia over lunch. 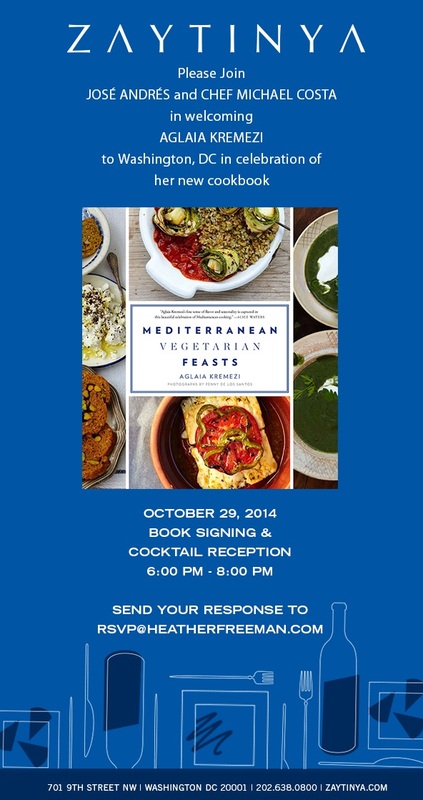 The cookbook is for anyone interested in Greek cuisine, specifically vegetarian dishes. There are plenty of simple recipes for beginner cooks as well as recipes that might take a few hours for advanced cooks. For my first trial of the book, I decided to go with something easy. Bouyourdi hardly needs a recipe. 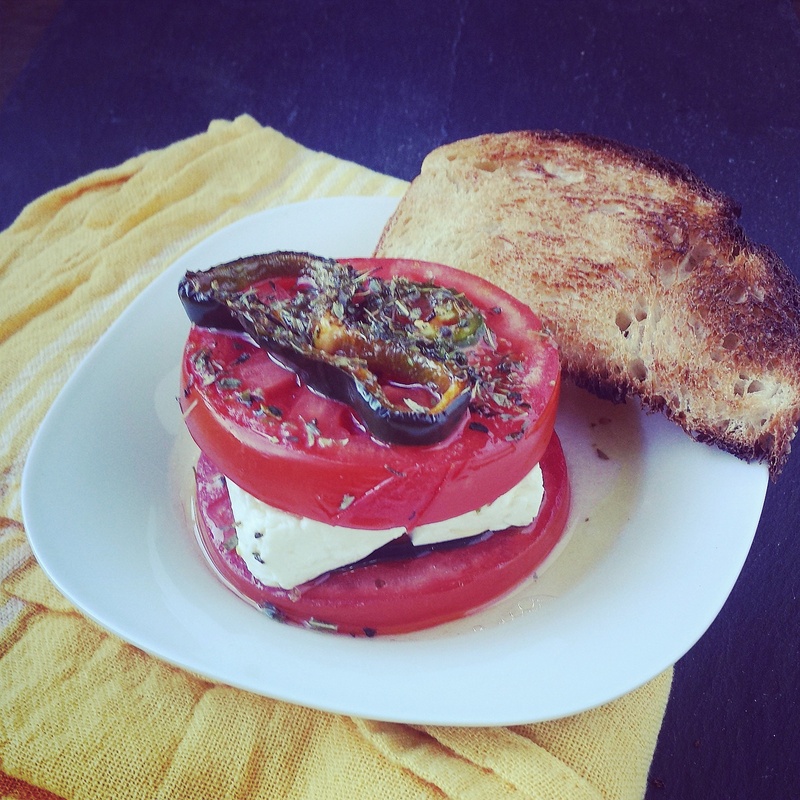 One or two slices of good tomato, a lavish slice of feta cheese and pieces of bell and hot pepper are doused with olive oil, generously sprinkled with oregano, and grilled in a very hot oven. Bouyourdi is brought to the table directly from the oven, often in individual clay pots, and enjoyed with plenty of fresh crusty bread to sop up the scrumptious oil. 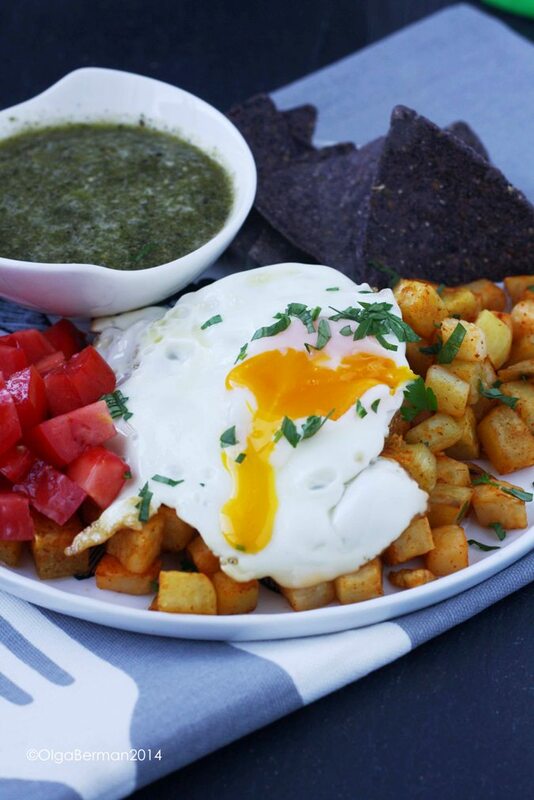 Although served as a meze in Greece, it can also be a wonderful breakfast or brunch dish for the whole family. Preheat the oven to 430F (220°C). Spread a double layer of paper towels on a large dish. Core the tomato carefully, slice horizontally into 5 to 6 pieces, and spread them on the paper to drain. Oil a shallow 8- or 9-inch (20- or 23-cm) baking dish, or four individual ramekins, and spread the tomato slices at the bottom, reserving 4 nice slices for the top. Sprinkle with some jalapeño and bell pepper slices. Arrange the feta pieces on top, place one tomato slice on each piece of cheese, and finally place 2 or 3 bell pepper rings on the tomato. Drizzle liberally with olive oil, sprinkle with oregano and the remaining jalapeño, and transfer to the middle of the oven. Bake for 15 minutes, or until the feta turns a light-golden color and the oil is sizzling. Serve immediately with warm bread. Preheat the oven to 430?F (220°C). Sorry for the instagram photos: the ones from my camera did not turn out. This was such a delicious brunch dish. 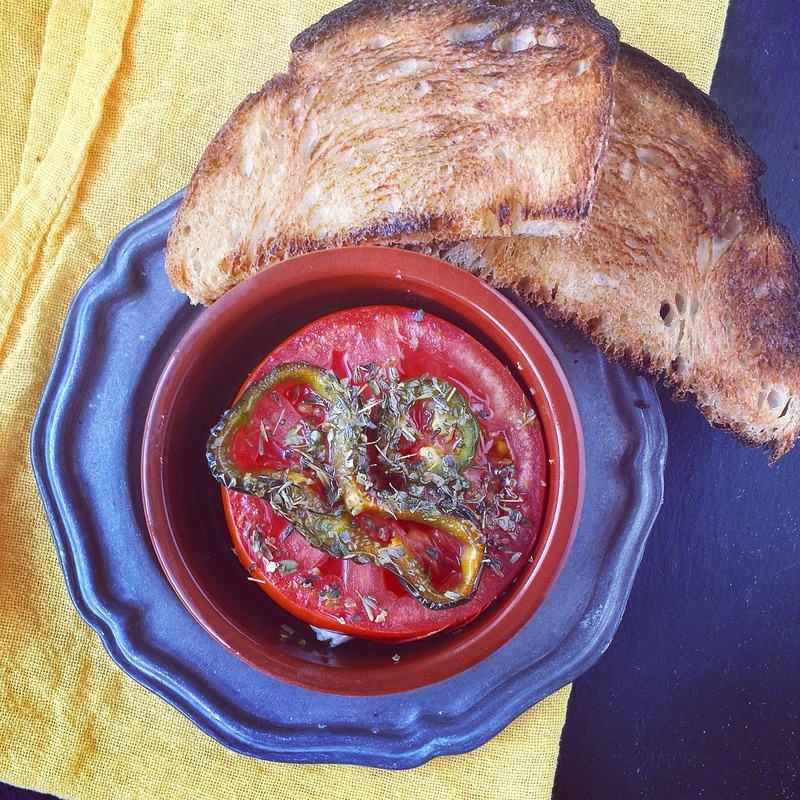 I loved the warm feta with roasted tomatoes and crusty bread. I used poblano peppers because that's what I had on hand, and they were SUPER SPICY. If you are not a huge fan of heat, go with regular peppers. This dish would be great served over polenta. Or with a poached egg on top. Which smells/scents bring back memories of cooking as a little girl? Aglaia said she remembers the smells of Sunday cooking when her mom would prepare veal cooked in lemon. She also remembers helping her mom to peel artichokes and sweet peas. When she peeled artichokes, her fingers would turn black and her mom taught her to rub her fingers with lemons to get rid of the color. Who inspired/taught you to cook? Aglaia helped in the kitchen from an early age starting with washing the dishes. She learned to cook from her mom and grandmother. Although Aglaia's sister grew up in the same environment surrounded by people who loved to cook, Aglaia is the one who ended up with that same love of cooking, while her sister doesn't like to cook. What's the biggest misconception about Greek cuisine? Greek cuisine in the US is very different from Greek cuisine in Greece. It's heavier and uses a lot of Crisco and margarine: something you would never find in a true Greek household. Also, some of the dishes that are popular in the US restaurants, gyro for example, are not typically served in restaurants in Greece. What are some of the things you must have while in the US? Not surprisingly, Aglaia likes to eat at Chinese, Japanese and Indian restaurants while in the US...something she doesn't get while in Greece. What are you working on next? Aglaia is going to be publishing monthly essays in a Greek magazine and is working on a collection of seafood and bread recipes. Can't wait to see those! 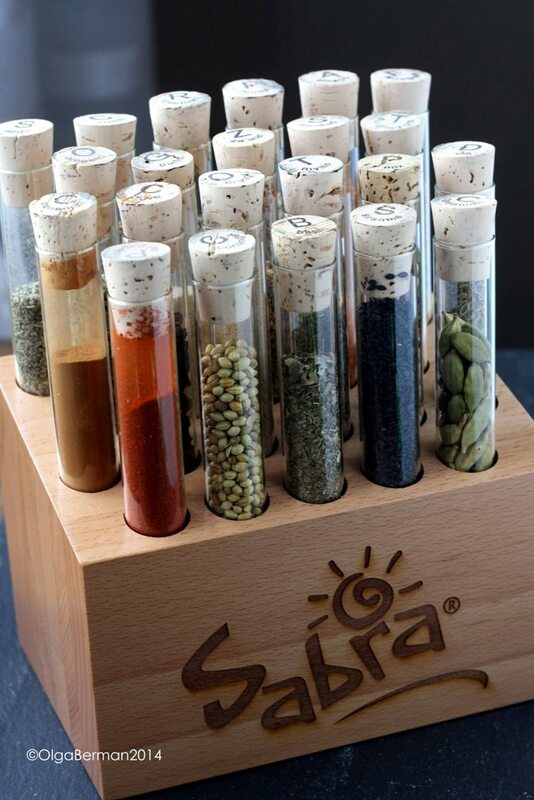 If you live in DC, come by Zaytinya tonight from 6-8 for a book signing and to meet Aglaia. Happy Monday!! Are you ready for an easy side dish you can make for tonight's Meatless Monday dinner? 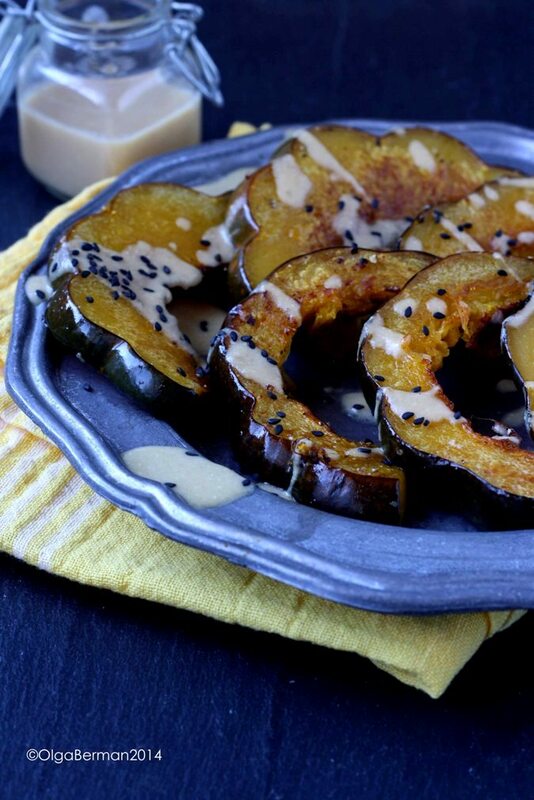 I think you'll really like my Roasted Acorn Squash With Miso Dressing & Black Sesame Seeds. 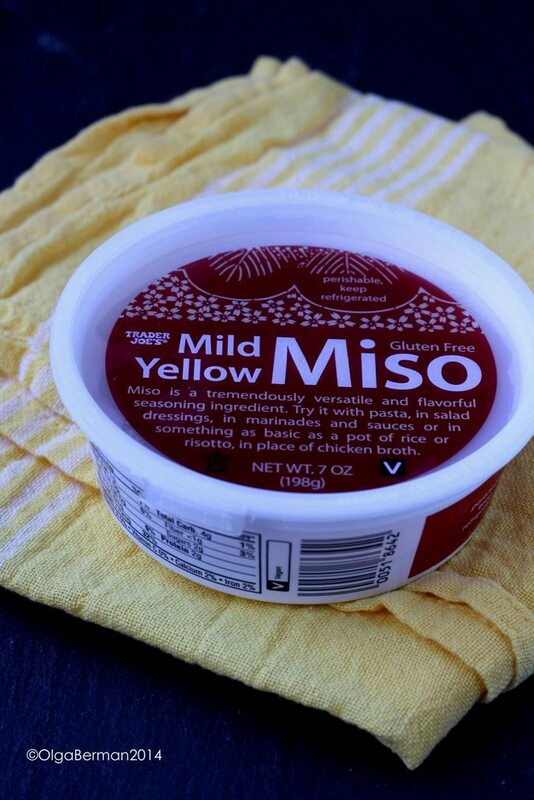 Over the weekend I picked up a random container of mild yellow miso paste. Although I love miso soup, I've never cooked with miso. I turned to my FB page to ask for suggestions and loved the link my friend Nicole posted for Teaism's Miso Glazed Sweet Potatoes. I've had those potatoes at Teaism several times and was excited to give the recipe a try by putting my own spin on it. First, I used acorn squash instead of sweet potatoes. Second, I used rice vinegar instead of mirin. And lastly, I served the dish straight out of the oven instead of cold. 1. Preheat the oven to 400F. 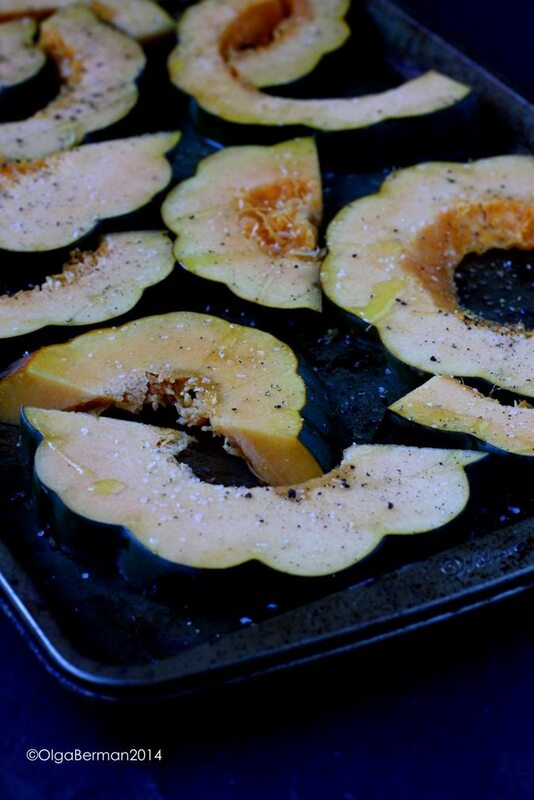 Drizzle the acorn squash slices with olive oil and season with salt and pepper. Roast for 30-40 minutes, flipping the slices once. 2. Whisk together ingredients for the dressing. 3. 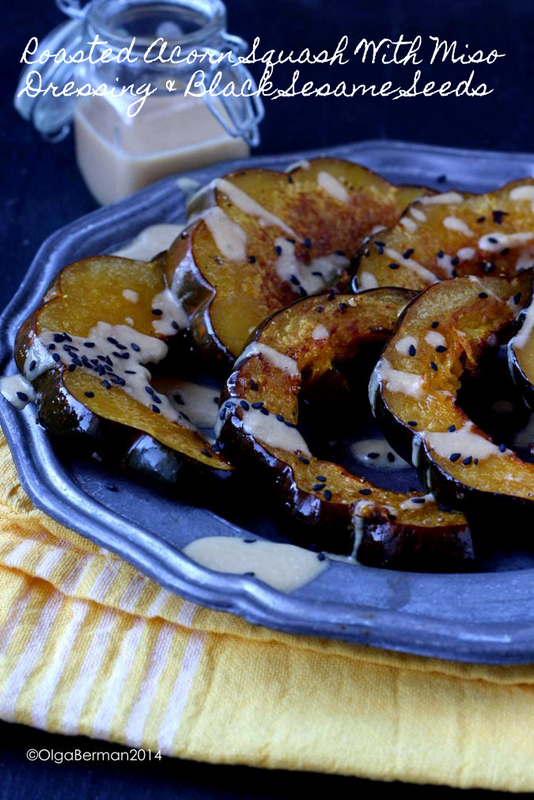 Serve roasted acorn squash slices straight out of the oven drizzled with miso dressing and garnished with black sesame seeds. I really liked how this dish turned out. The black sesame seeds provided a great little crunch and color contrast. The miso dressing would be good on SO MANY THINGS and was a great salty counterpart to the sweet acorn squash!! What would you have done with miso paste? 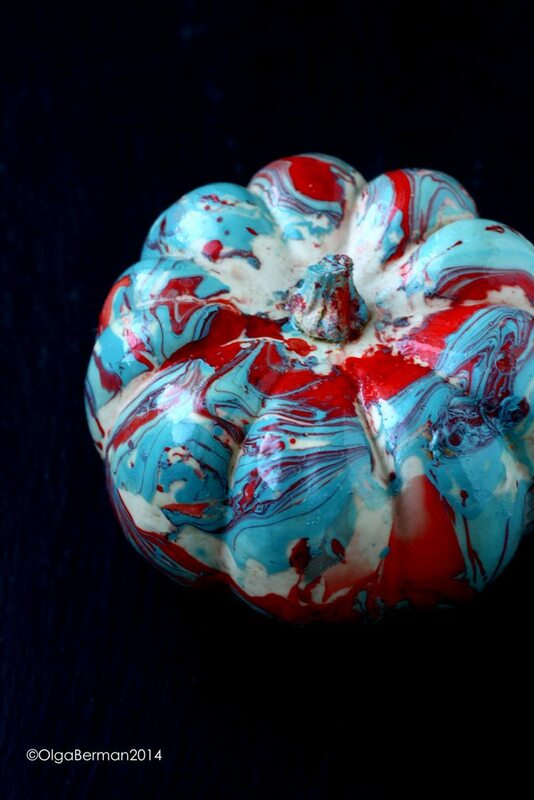 How To Decorate A Pumpkin Without Carving: Use Nail Polish! Pumpkins. Pumpkins. Pumpkins!!! Good lord, pumpkins are everywhere. 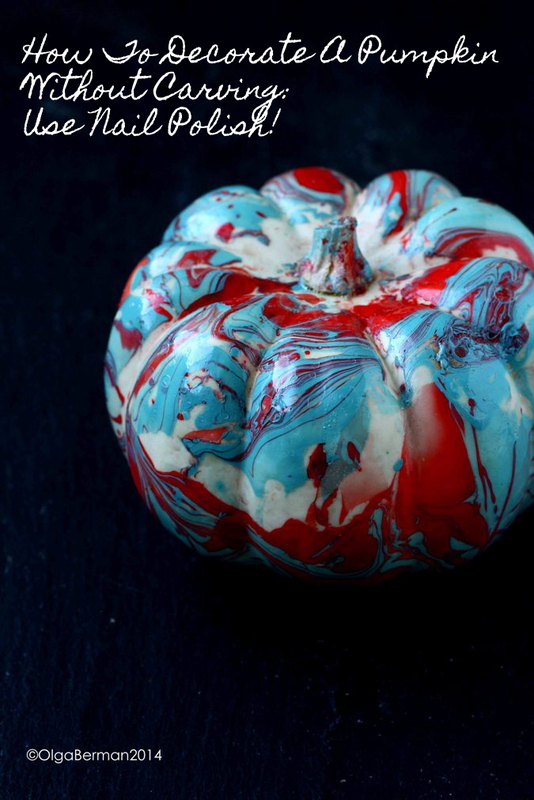 A few weeks ago I saw a gorgeous idea for decorating a small pumpkin using nail polish on Say Yes blog. I loved it. No need to carve. No fear of the pumpkin rotting. You can use whichever colors you like or match your décor AND the entire project takes about 10 minutes (including drying time!). As luck would have it, the order of produce I received from From The Farmer last week included an adorable white decorative pumpkin. The stars aligned perfectly! 1) Fill a disposable bowl with warm water (make sure the bowl is deep enough for you to dunk the pumpkin). 2) Drop some nail polish into the water using whichever color combination you like. The nail polish will at first sink, but then will magically rise to the surface of the water. Put enough nail polish to cover the surface of the water. 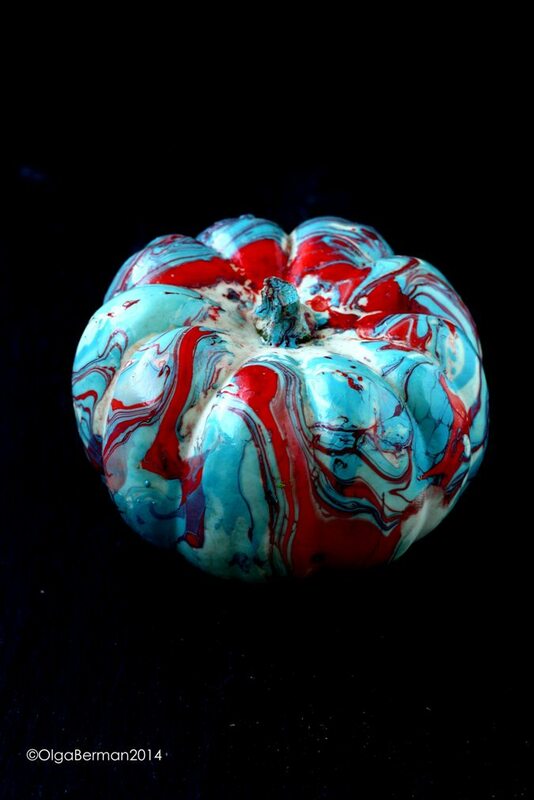 Use a toothpick to swirl the colors. 3) Dip your pumpkin! 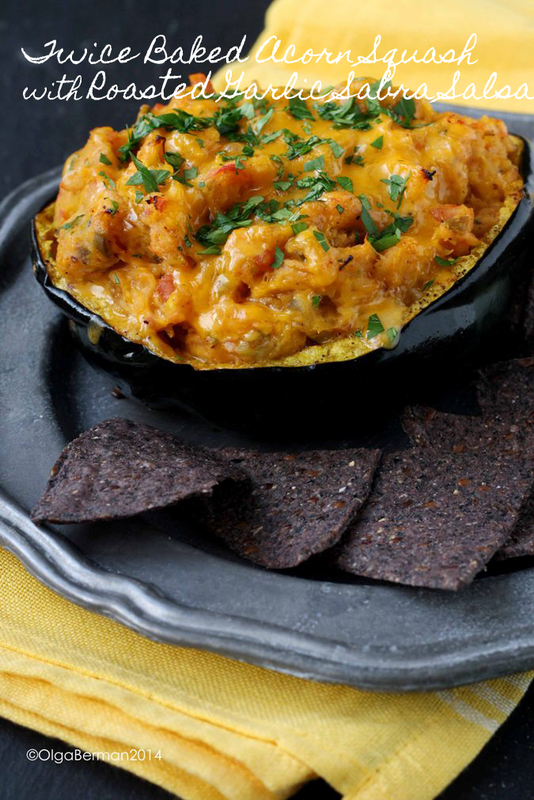 You can dip the entire pumpkin or half the pumpkin. I had to dip mine twice first lower half, then upper half (letting it dry in between and adding more nail polish). 4) Let the pumpkin dry completely. Isn't it GORGEOUS??? I love how it turned out. Dipping the pumpkin into the bowl with nail polish messed up my manicure: wear disposable gloves if you have them. Thanks Say Yes for an awesome idea and From The Farmer for the adorable white pumpkin. 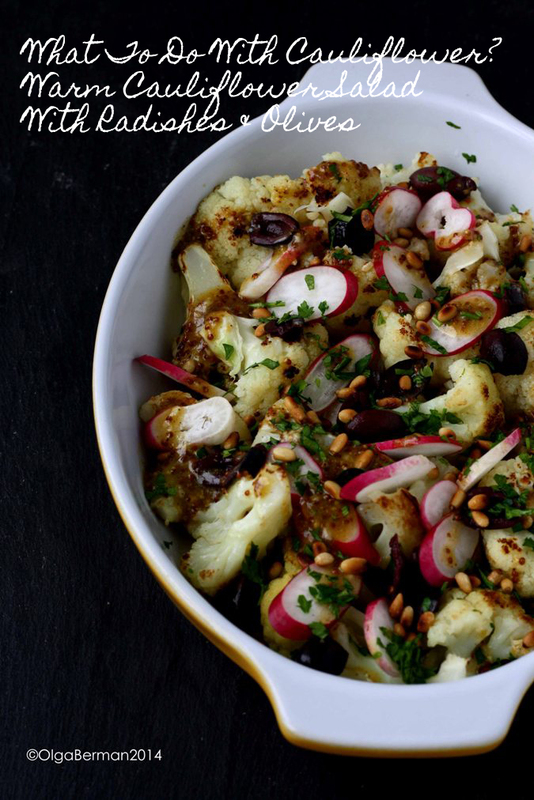 Cauliflower is one of the most versatile vegetables. You can roast it, boil it, eat it raw, turn it into a soup, or pan fry it. 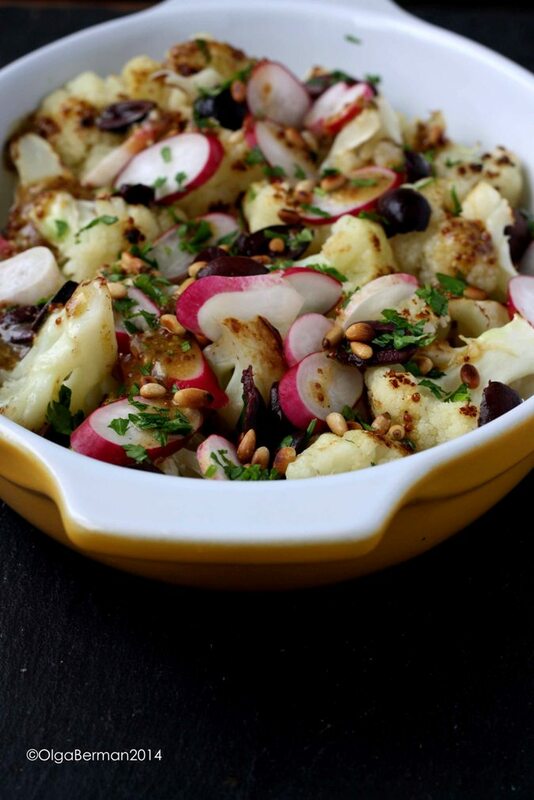 I will share some of the recipes at the bottom of the post, but first, here's a no recipe "recipe" for a warm salad with cauliflower and a few other fun ingredients. 1. 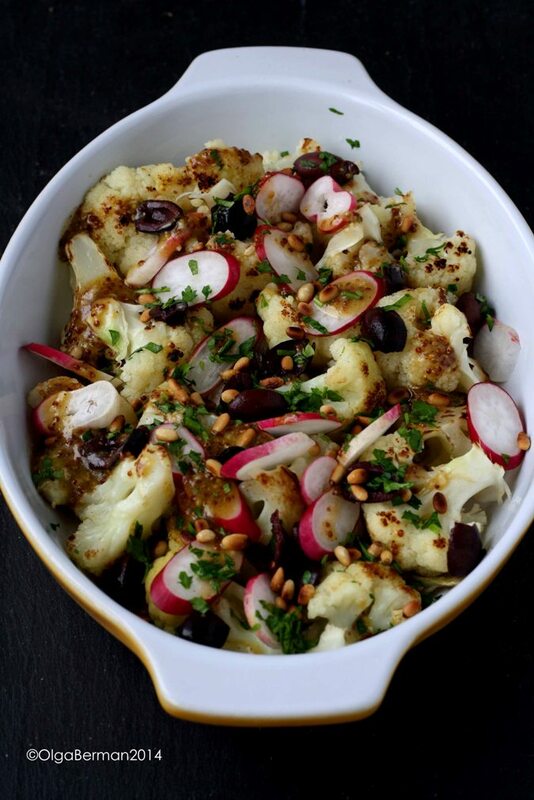 On a platter mix together the cauliflower, radishes, olives, pine nuts and parsley. 2. Whisk together the ingredients for the dressing and pour over the salad. How simple is this? SUPER simple! I loved how the crunchy slightly sweet pine nuts contrasted the saltiness of the olives. If you are not planning on eating the entire salad at once, keep pine nuts and the dressing in their own containers in the refrigerator. How do you like to prepare cauliflower? Menu MBK: Chef's Table. 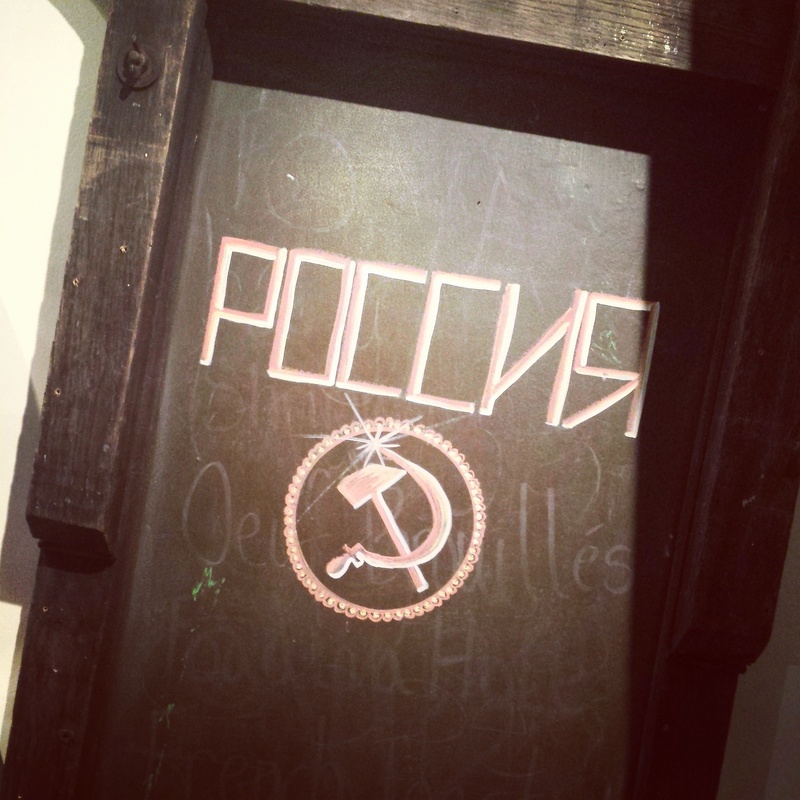 Russian Menu. Earlier this week I had a chance to dine at Menu MBK and try this month's chef's table menu that was inspired by Russian cuisine. The meal was graciously covered by the restaurant, but as always all opinions are my own. I spent the first 13 years of my life in Moscow, Russia where I was born and where both my parents and grandparents cooked food. Russian food. Ukrainian food. 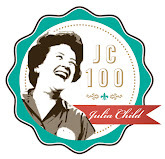 Jewish food. Good food. I still make Russian food at home, and last year featured quite a few recipes in my Russian Recipes Revisited series. Whenever I visit my parents in Seattle, I have a big pot of borsch waiting for me lovingly prepared by my dad. The menu from the executive chef Frederik de Pue at Menu MBK was based on some of the most popular Russian dishes, but reimagined, decomposed, and modernized. This was not your grandparents' Russian food, but it was equally delicious and lovingly prepared. Below are some of my favorite courses. 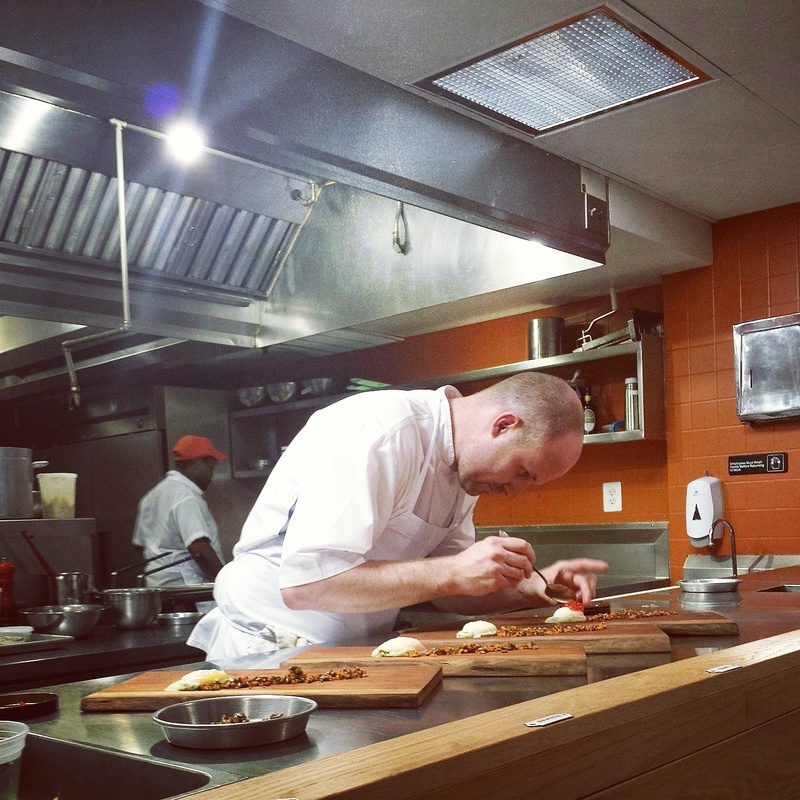 Above is chef Frederik plating his take on Salad Olivie. His version included potato foam!!! And red caviar. And a poached egg. And a pea puree. The dish was beautiful and well thought out, but I'll take the original version of the salad any day. The second course, borsch, was a play of textures and colors. 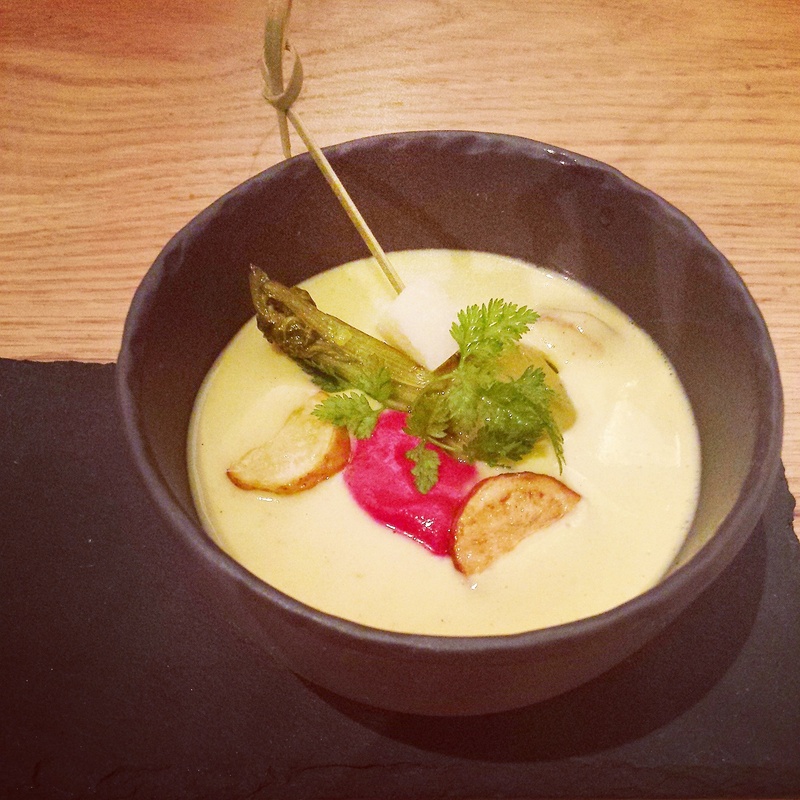 The white roasted beets were pureed to the smoothest consistency and were contrasted by the crispy potatoes. There was a puddle of pureed red beets in the middle of the bowl and a roasted beet on a skewer. I loved it. I am also very happy the name of the dish was spelled without a t. Here's my version of the soup. It's hard to believe, but I've only made Beef Stroganoff once. I loved the combination of noodles, mushrooms, beef and a creamy sauce in the recipe my friend Sylvie and I made. Chef Frederik's dish did not disappoint. 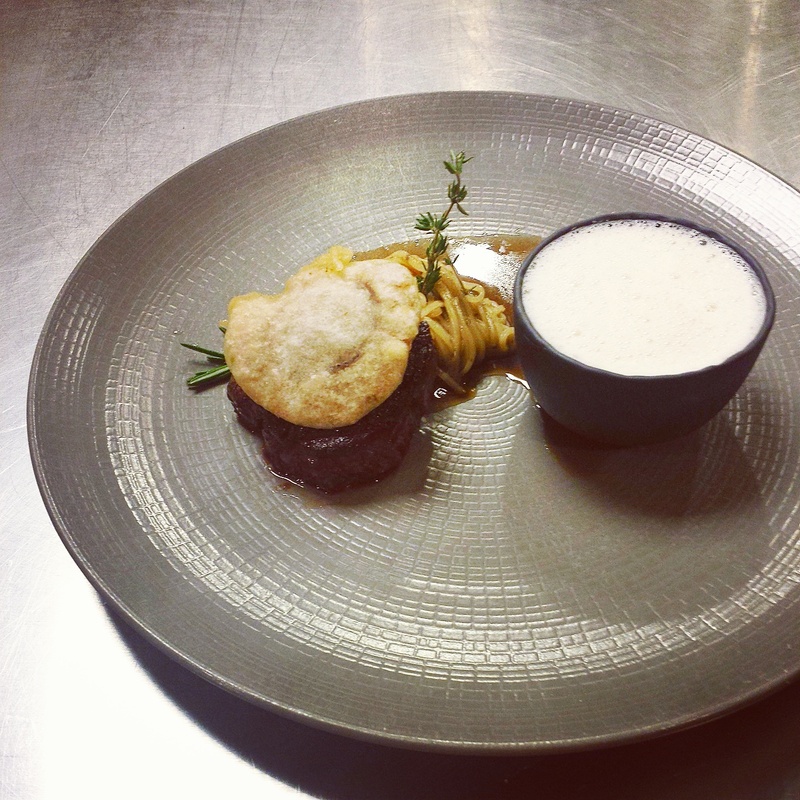 My favorite component of his dish was the mushroom cappuccino, as the chef called it. It was the essence of mushrooms mixed with cream and it was divine. Sweet and savory. Satisfying. Foamy. I could have drank an entire big bowl of it. 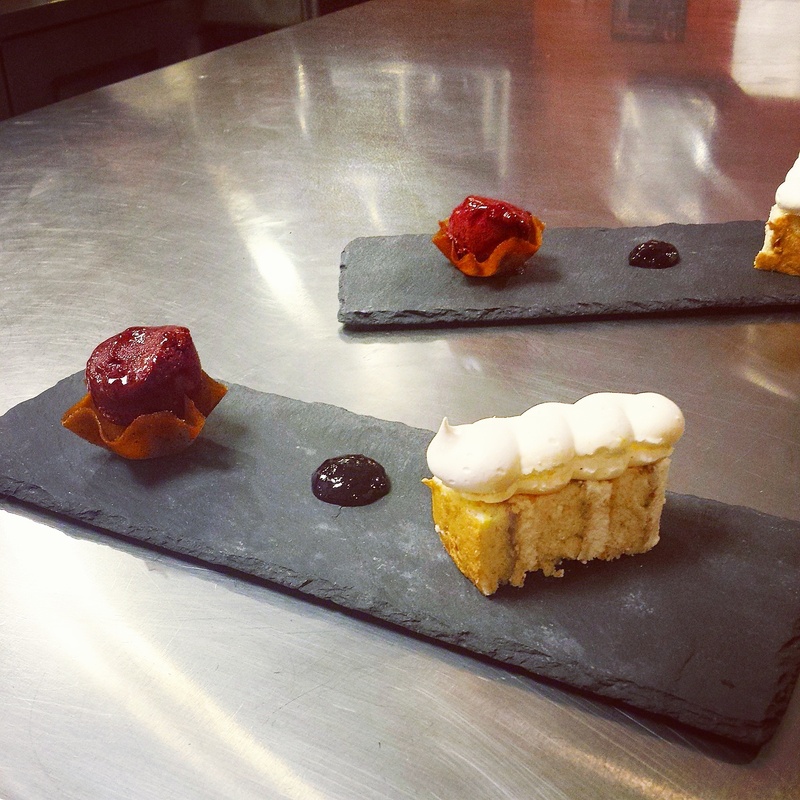 For dessert, there was Tort Kiev: pastry cream, meringue, jam and cassis sorbet. I loved seeing the chef plate every dish, but especially this one. It was pretty without being pretentious. Filling without being overwhelming. I don't remember ever having this dish growing up, instead we had sour cream cake. Both are winners in my opinion. I loved sitting at the kitchen bar and seeing each plate being plated and explained by the chef. This special menu comes paired with drinks (as an option), but alas those did not do much for me because I'm a light weight. I've much more enjoyed the complimentary champagne that was served before the meal. I'm looking forward to returning to Menu MBK and trying out their regular menu and their brunch! Today instead of a recipe I want to share with you a super duper easy and fun diy project that you can make to spruce up your refrigerator or to give as gifts to your friends. When I was in Seattle last month, I found an adorable pin/button at a museum store and bought it immediately. After all, it said More Mayo and you know how much I ♥ mayonnaise! 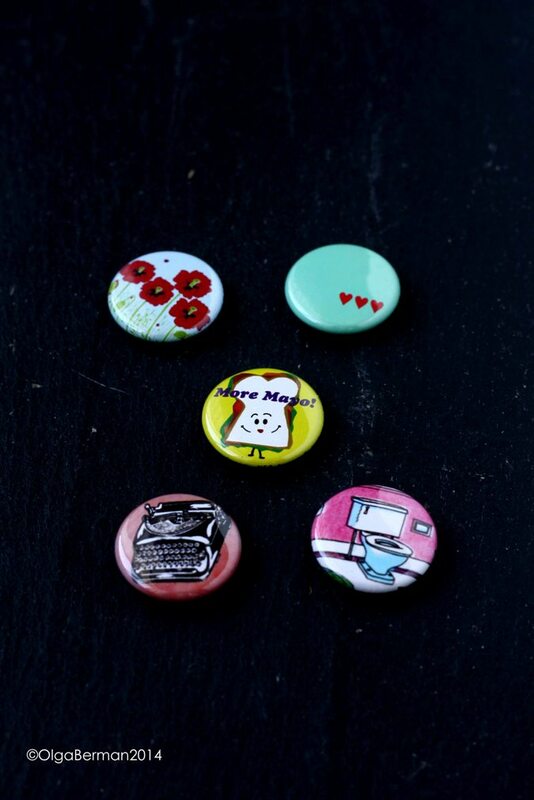 Then, I found a few other adorable pins/buttons at a little coffee/gift store nearby. Because I don't wear such pins/buttons, I decided to turn them into magnets once I flew back home to DC. 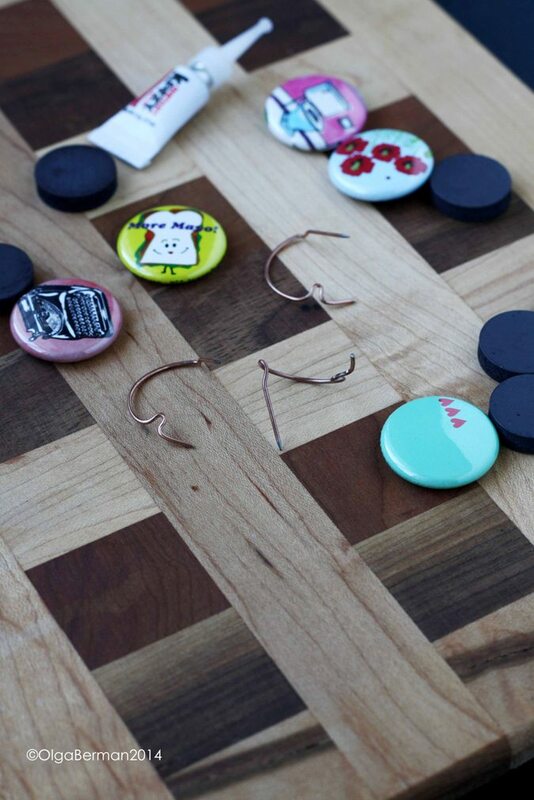 All you need are pins/buttons, super glue and magnets. I happened to have a bunch of magnets in the perfect size!!!! 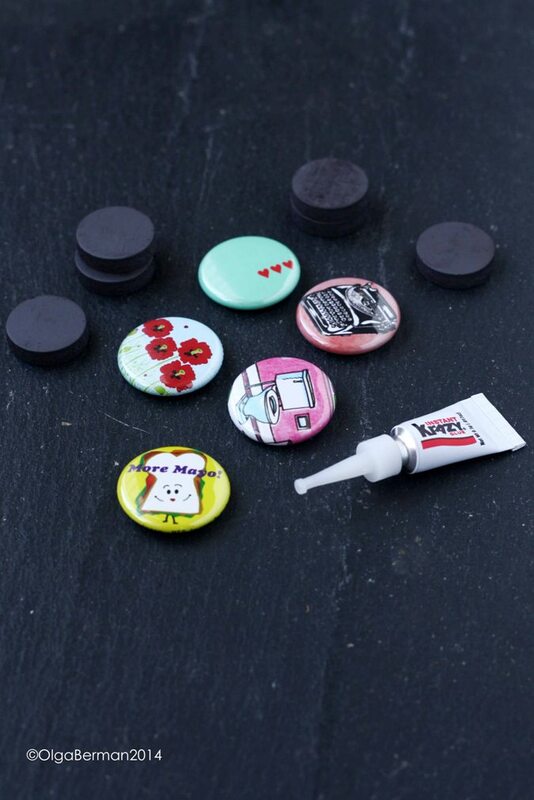 All you do is take out the back metal part of the pin/button and then superglue the magnet right inside. This could not have been easier! 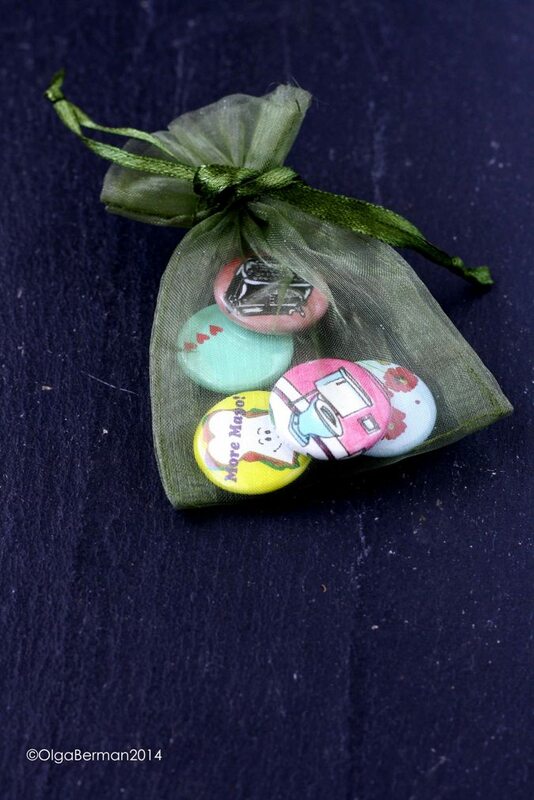 Put these in a cute little bag and give them as a gift, or put them on your refrigerator. 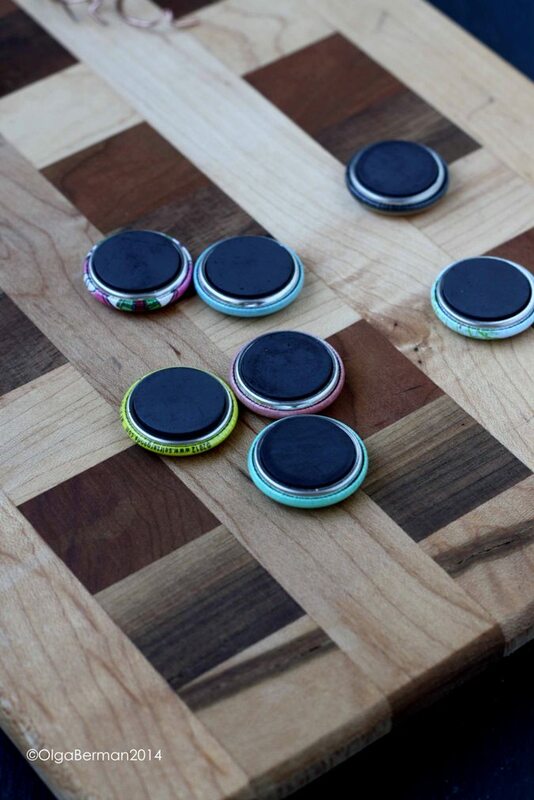 Have you been doing any diy projects lately? You guys! I hate cleaning. There, I said it! From time to time, however, I talk myself into cleaning and organizing and feel so much better once those tasks are done. Let me clarify that I don't have an actual pantry. 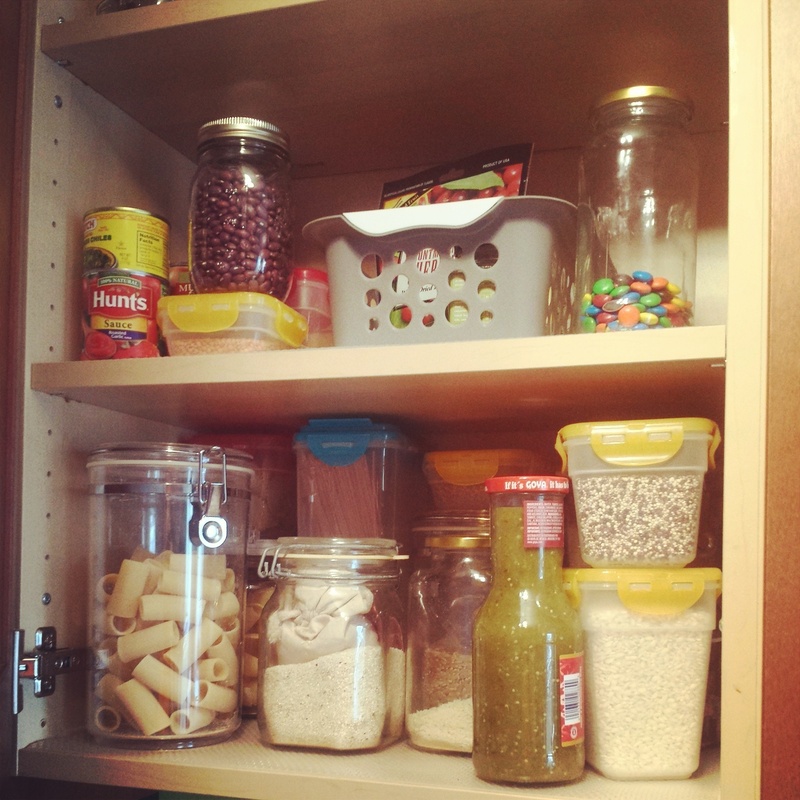 My "pantry" is a kitchen cabinet: space is limited and has to be used in a smart way. That's why the POP Container set is so awesome! 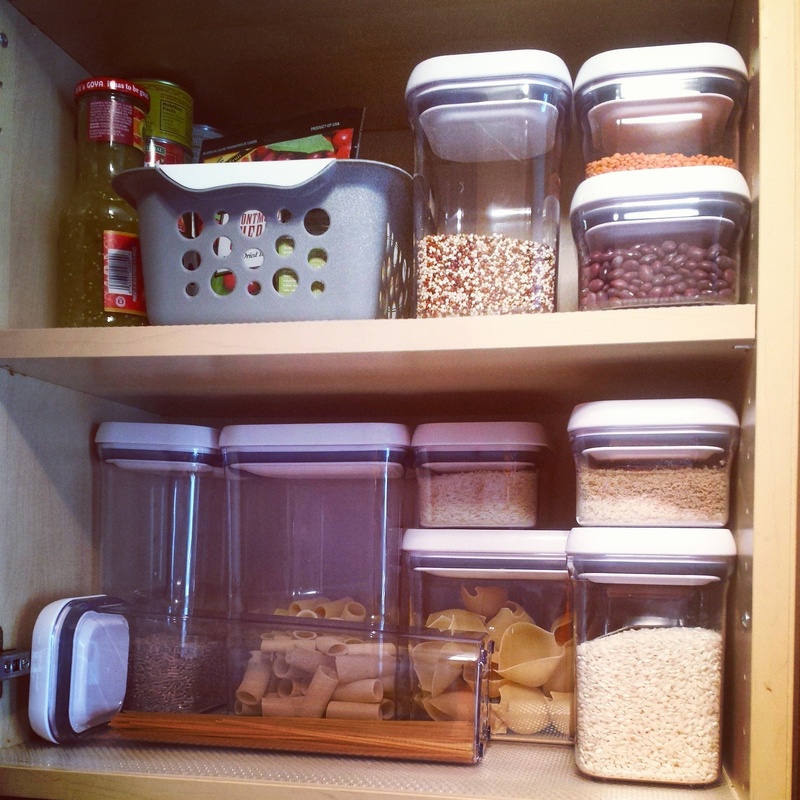 The containers are square or rectangular and are stackable: no space is wasted. They are clear, so you can see exactly what you have on hand and you only need one hand to open or close them: this would have been oh so very useful back in February when I had a broken arm. 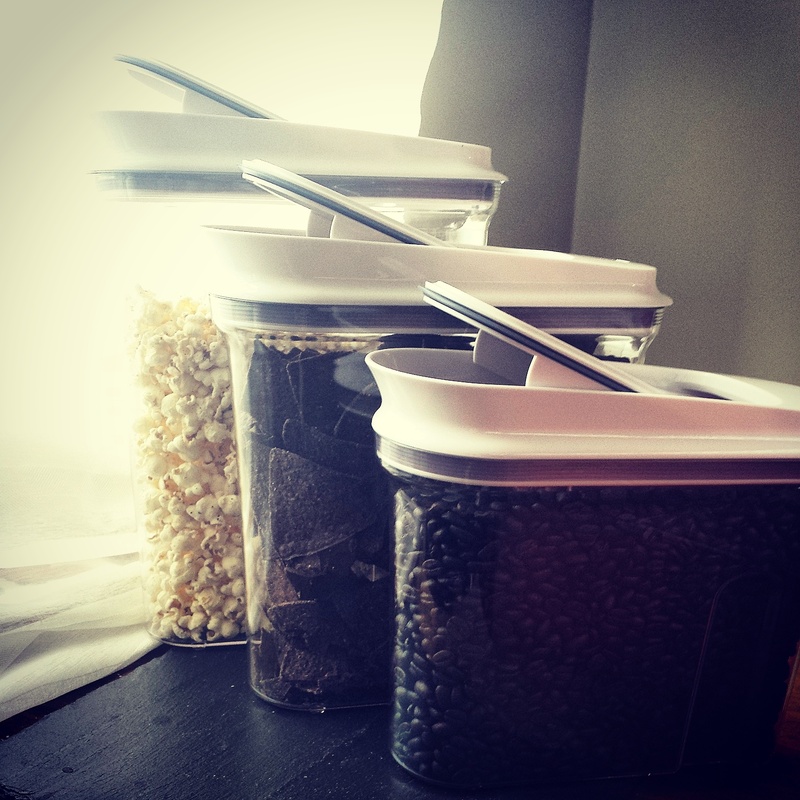 Because I live on my own, I found some of the larger containers not as useful, but I absolutely love the smaller containers. 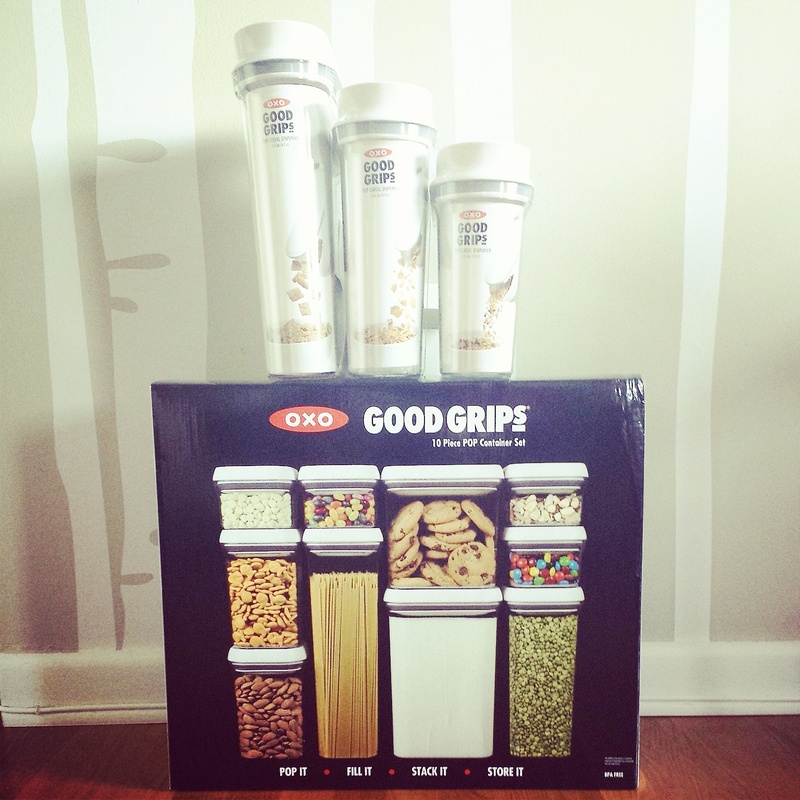 Because I rarely eat cereal, I used the OXO Cereal Dispensers for coffee, popcorn and chips! 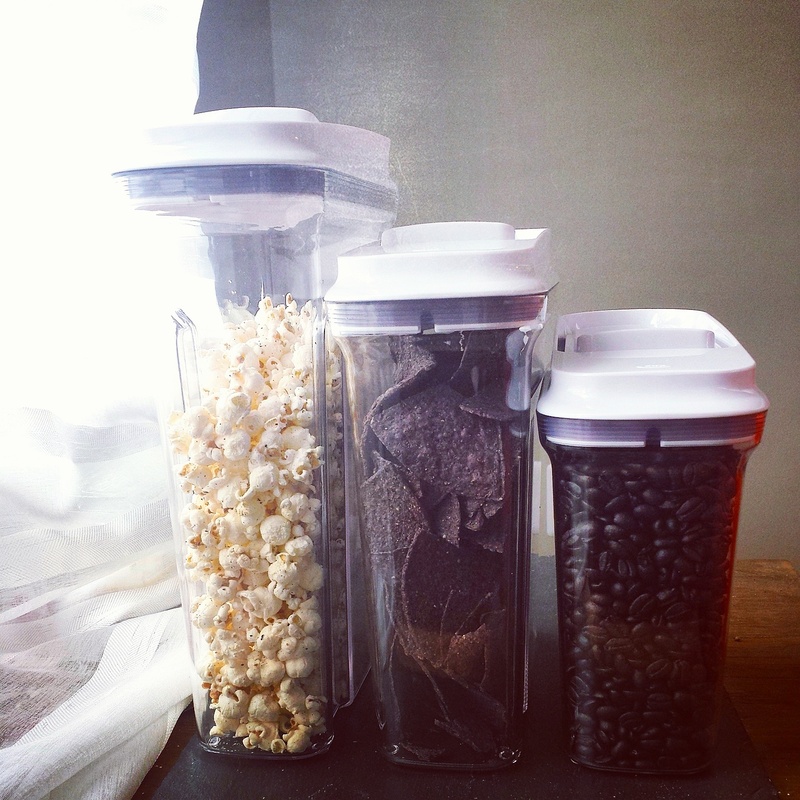 The lids make it easy to pour the contents out and because they are air tight, your coffee (etc) will stay fresher longer! You can visit The Container Store to get your own set of OXO products or even better enter to win a prize pack worth $500, including your choice of OXO Storage & Organization tools (up to $250), as well as a $250 elfa gift card October 13-31! Disclosure: I was provided with the set of OXO products as a gift but was not compensated otherwise for writing this post. All opinions are my own. 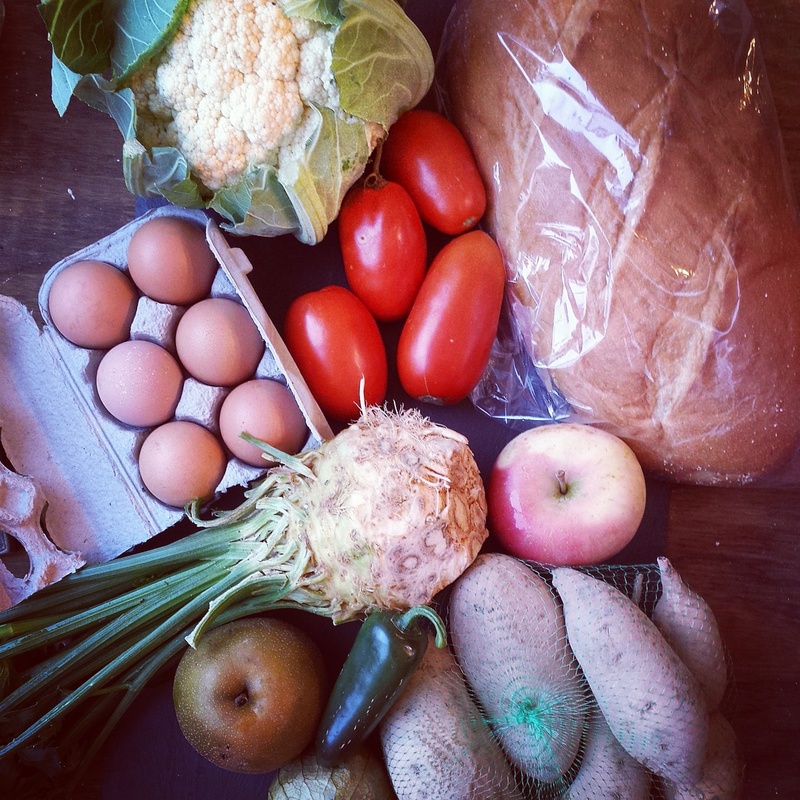 Last month I was approached by a local food delivery service, From The Farmer, to see if I'd be interested in giving them a try for free. My answer wasn't an automatic yes. Why? I had mixed feelings about accepting this generous offer because I have been a happy paying customer of a similar service, Washington Green Grocer, for the last six months. In the end, I decided that there is enough room for multiple food delivery services, and it would not hurt to try something new. 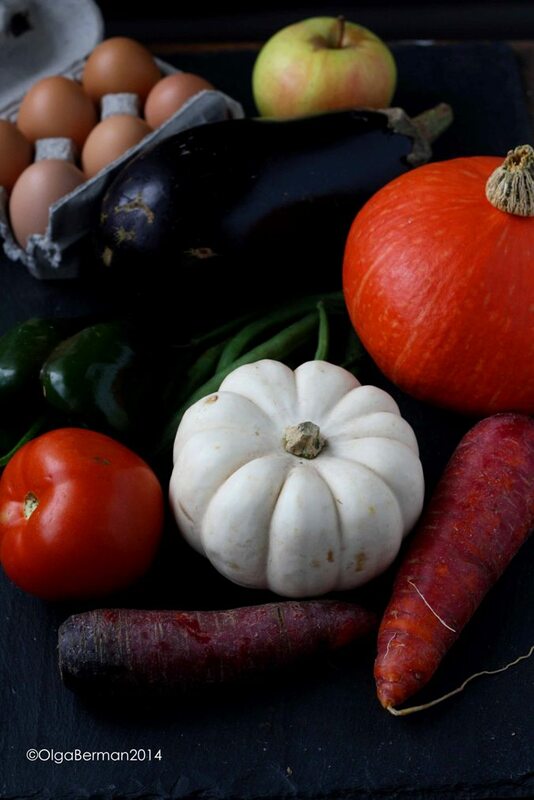 From The Farmer sends a few emails prior to delivery to let you know what's going to be arriving at your door with links to recipes using some of the ingredients. This is your chance to say you don't like a certain item and ask for a double of another one. All the items that you get delivered are local and seasonal. Alas, they don't come with a hot farmer. I know, nothing in life is perfect. 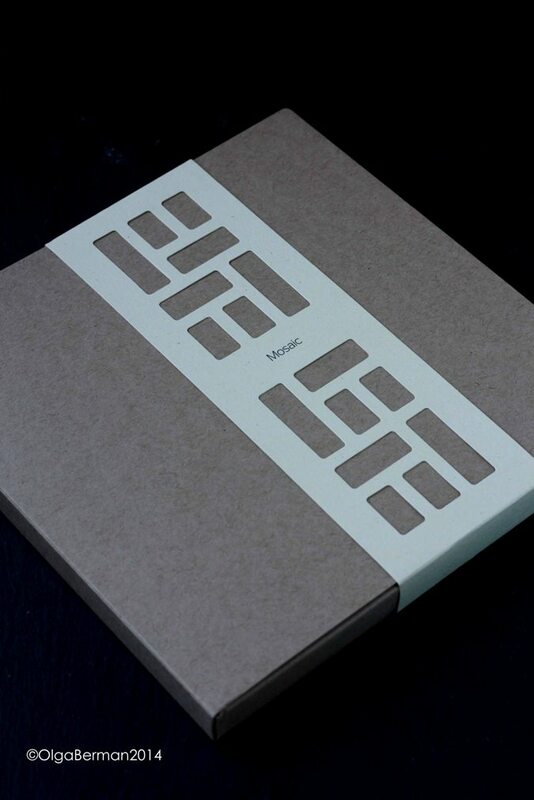 The delivery happens overnight, so by the time you wake up in the morning, your box will be waiting for you outside of your door and you can promptly put the items in the refrigerator. I opted for a single bushel with half a dozen eggs and a loaf of bread. These are some of the items I received last week. LOVED the bread. The eggs had the brightest yellow yolks I've seen in a while. The Roma tomatoes were red through and through, just like the ones I saw in Bakersfield, and both the apples and the Asian pears were sweet and crunchy. I've yet to use the cauliflower: maybe tonight. 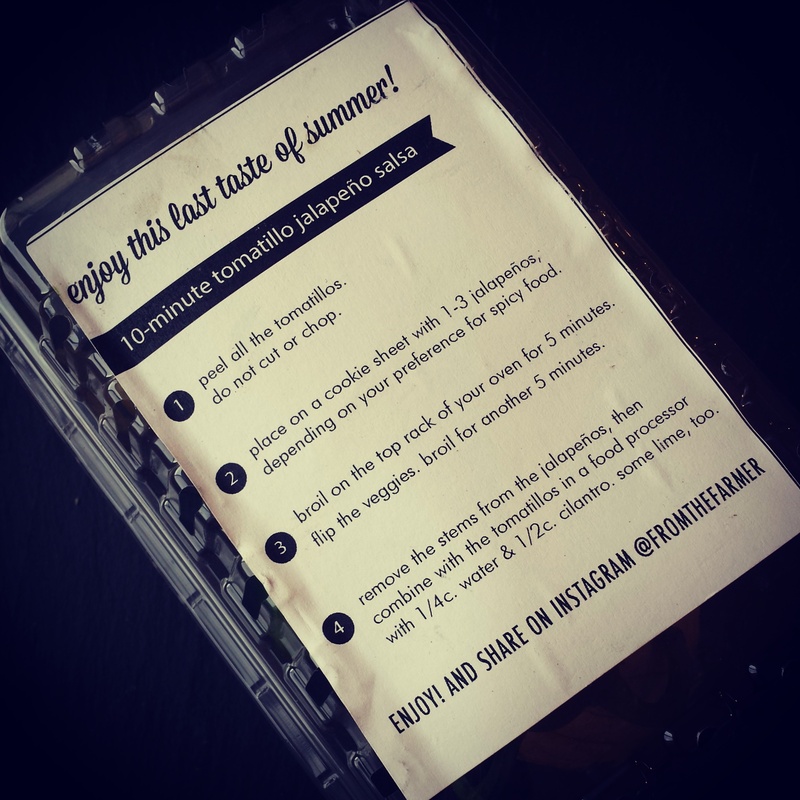 The pack of tomatillos and jalapenos came with a recipe printed directly on it! 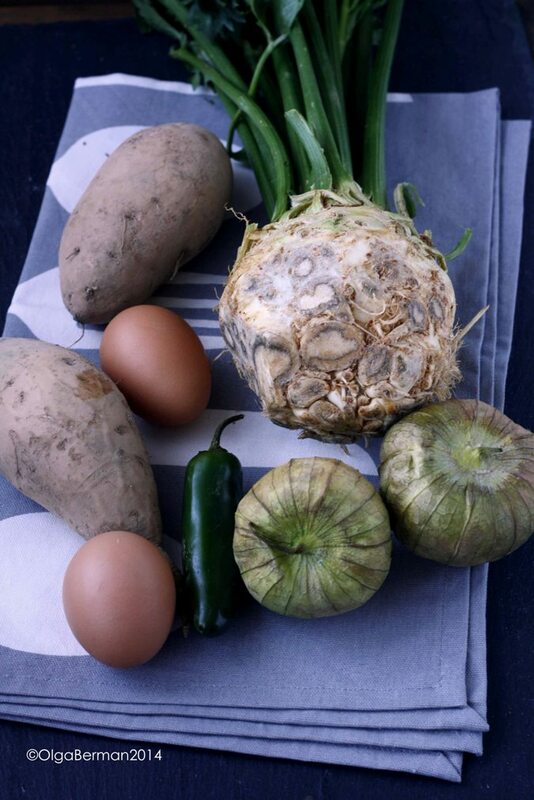 Over the weekend I decided to use some of the produce I received from From The Farmer to make Celeriac & Sweet Potato Hash with Fried Egg & Tomatillo Salsa. 1. Preheat the oven to 425. Drizzle diced celeriac root and sweet potatoes with olive oil and season with salt and pepper and paprika. Roast in a single layer on a cookie sheet for 20 minutes. 2. Increase the temperature of the oven to 475 and continue to roast the vegetables for 10-20 more minutes. Keep in mind that celeriac cubes will remain a bit crunchy. 3. Meanwhile, char the tomatillos and jalapeno directly on the gas flame. If you don't have a gas stove, you can broil them. 4. Removed the seeds from the jalapeno. Puree charred tomatillos and jalapeno with lime juice, parsley, and season with salt. I added some water to this mixture, which made the salsa watery and wasn't necessary. 5. 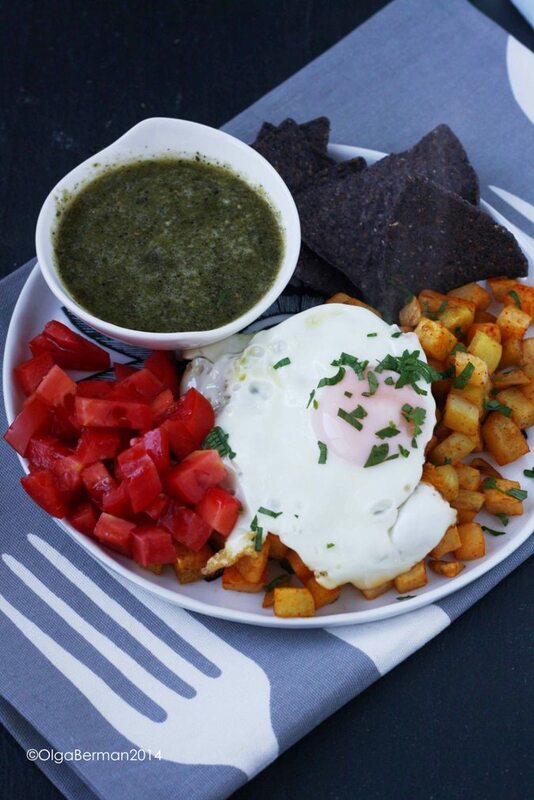 Serve roasted celeriac root and white sweet potatoes topped with a fried egg and fresh parsley with a side of fresh tomatoes, tomatillo salsa and tortilla chips. This was a great weekend late breakfast! I had leftover roasted vegetables and tomatillo salsa that were great as toppings/dressing for a salad. How great did that runny yolk look??? Thank you From The Farmer for a bushel of produce!! I look forward to seeing what comes in two weeks. I loved the freshness of the produce and friendly customer service. Disclosure: I am receiving a total of two free orders from From The Farmer. 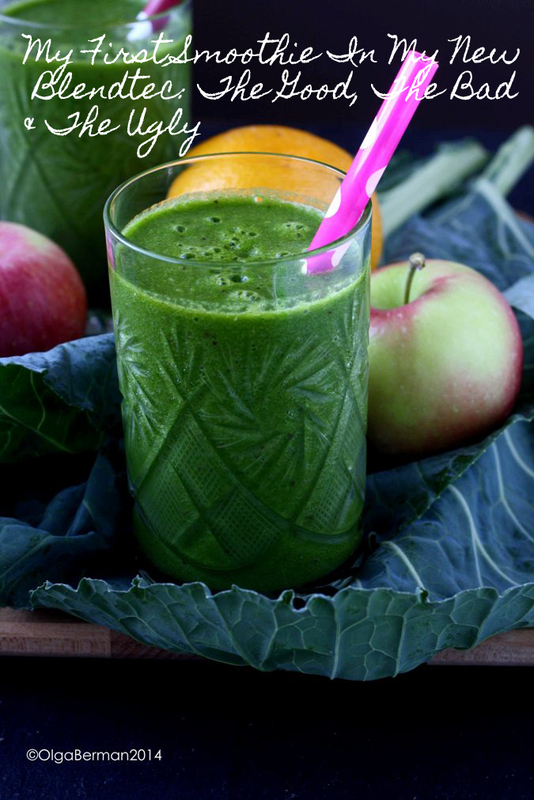 I was not compensated for this post or the recipe. All opinions are my own. Fall is finally here! I spent the weekend in pajamas catching up with my TV shows, wishing I had a fireplace, or a warm body close by, finally unpacking from my trip to Seattle and doing 3 loads of laundry. I also went to see Gone Girl, which I highly recommend, and of course cooked a couple of things. 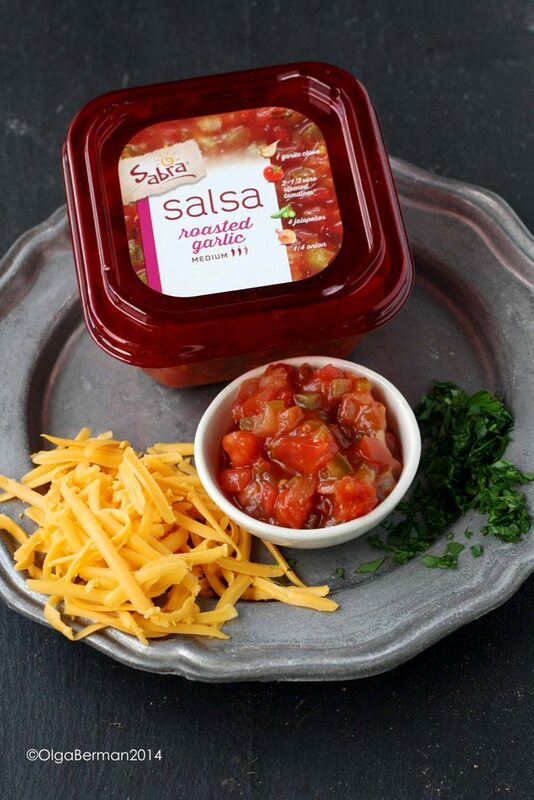 One of the recipes I made was this Twice Baked Acorn Squash with Roasted Garlic Sabra Salsa. 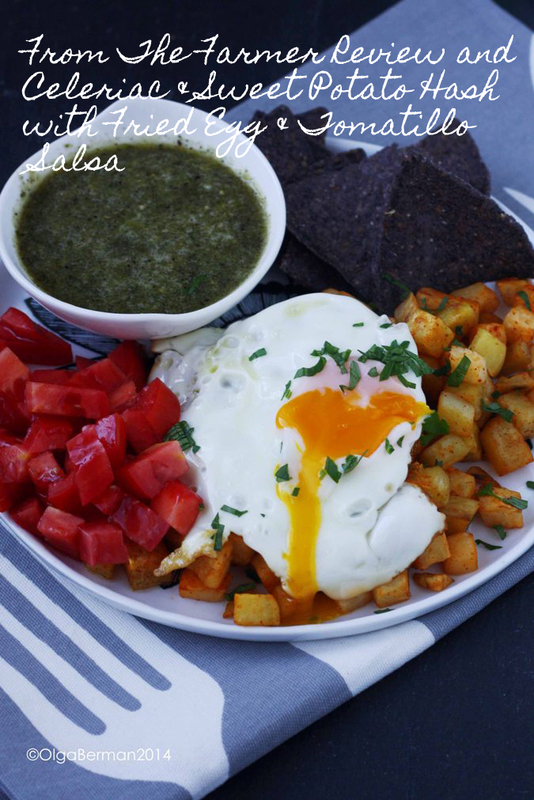 This is a third recipe I've created for Sabra using their line of salsa products. You can read all about my awesome trip to Bakersfield sponsored by Sabra and the first two recipes I created: Sabra Salsa Burger with Peaches, Avocado & Sriracha Mayo and Sweet & Spicy Shrimp with Sabra's Mango Peach Salsa, Pineapples and Scallions Over Orzo. 2. 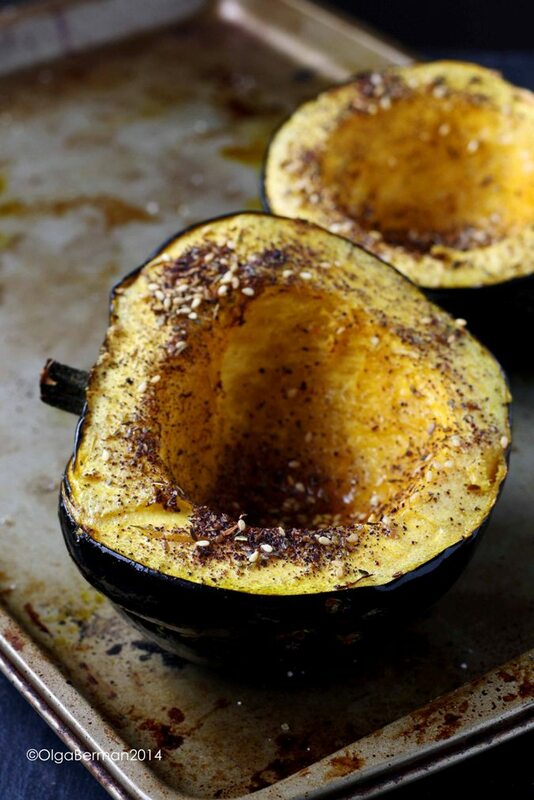 Drizzle acorn squash halves with olive oil and season with salt and pepper and zaatar. Roast the squash cut side up for about 30 minutes or until tender. 3. Allow the squash to cool slightly and carefully remove the flesh using a spoon keeping the outer shell intact. 4. 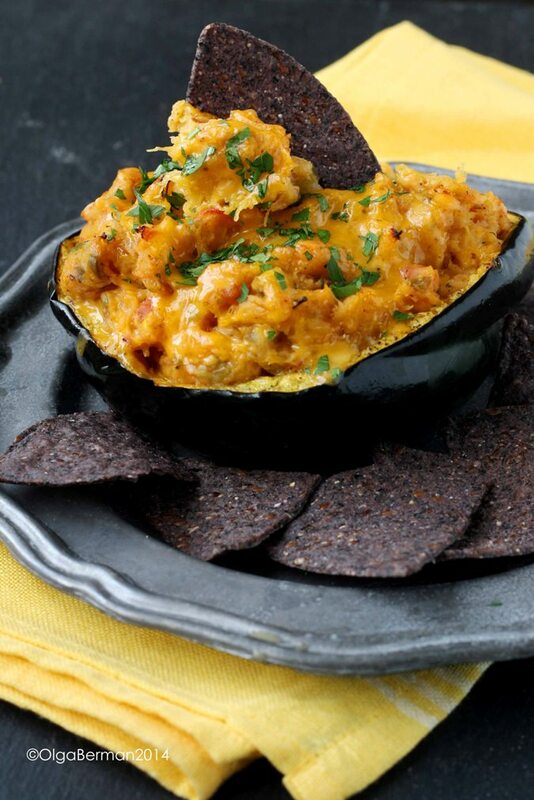 In a bowl, mash the acorn squash insides and add the salsa, 3/4 cups of cheddar cheese and 2 tablespoons parsley. Add more salt and pepper if needed. 5. Turn the oven down to 375. 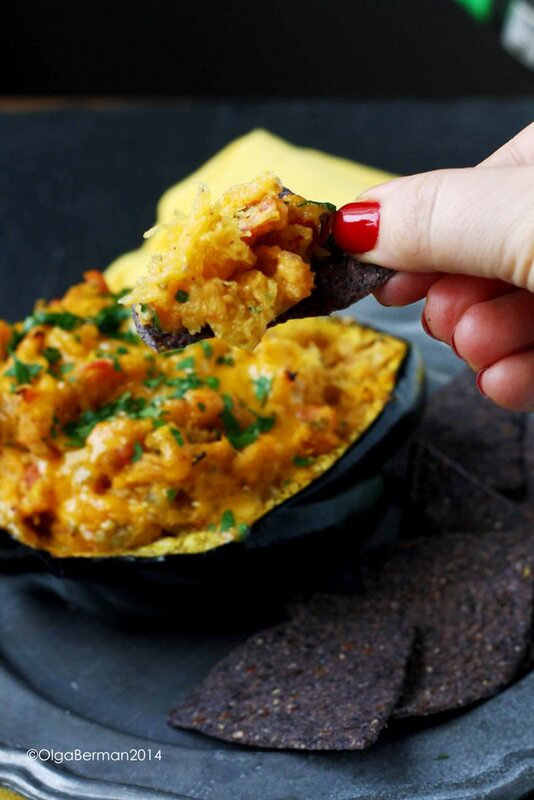 Add the acorn squash mixture back into the shell (you can use one of the halves or both or even simply use a baking dish), top with remaining cheese and bake for 15-20 minutes until the cheese is golden brown. 6. 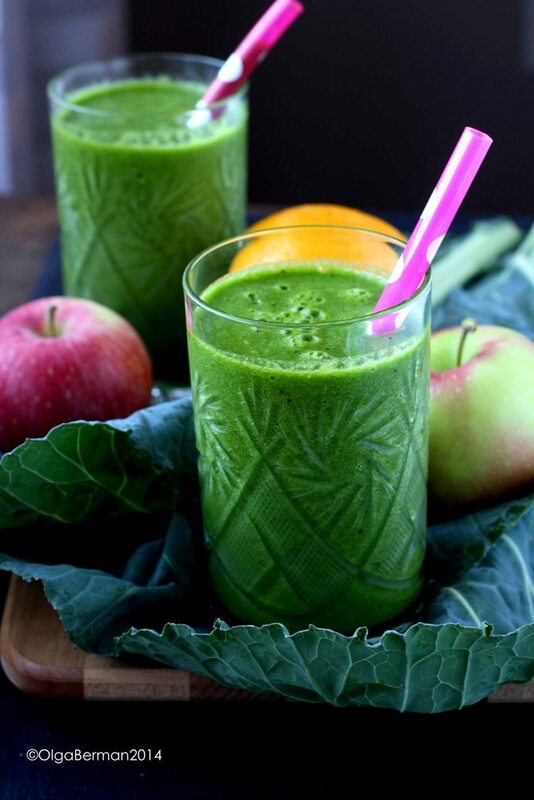 Top with parsley and serve with chips or toasted sliced bread or as a side dish. Guess what? 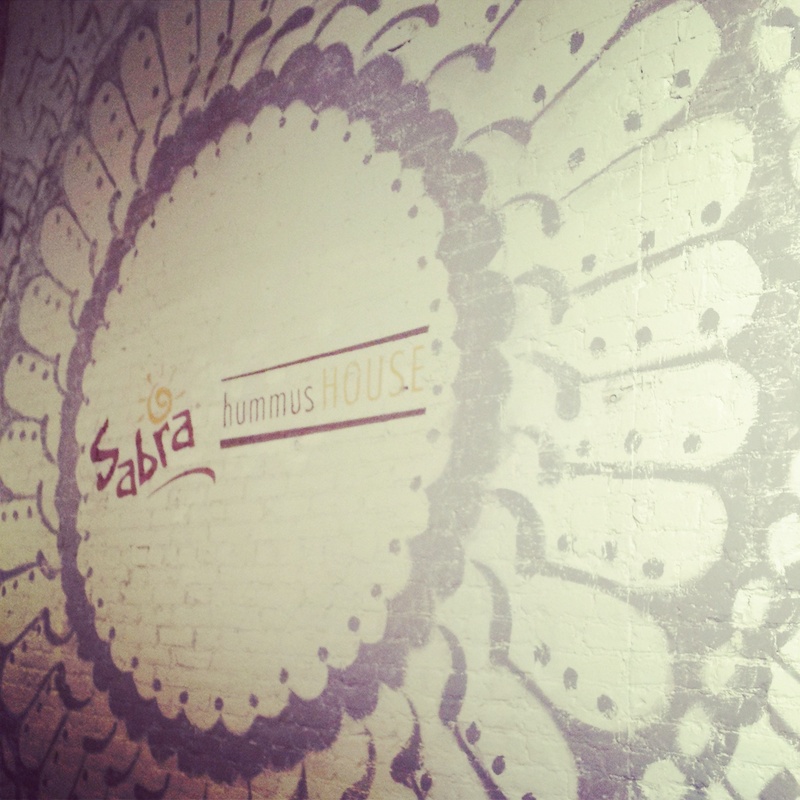 There's a new house in DC: a SABRA house! What's a Sabra Hummus House you may ask? It's a fun and gorgeous new place to eat in the Georgetown neighborhood of DC brought to you for a limited time by the people who make hummus, salsa, guacamole, tzatziki and other fun concoctions. Because this is a pop up restaurant and not a permanent space (yet!? ), you have got to hurry up and make sure to visit the Sabra Hummus House for lunch or dinner from now until October 26th. 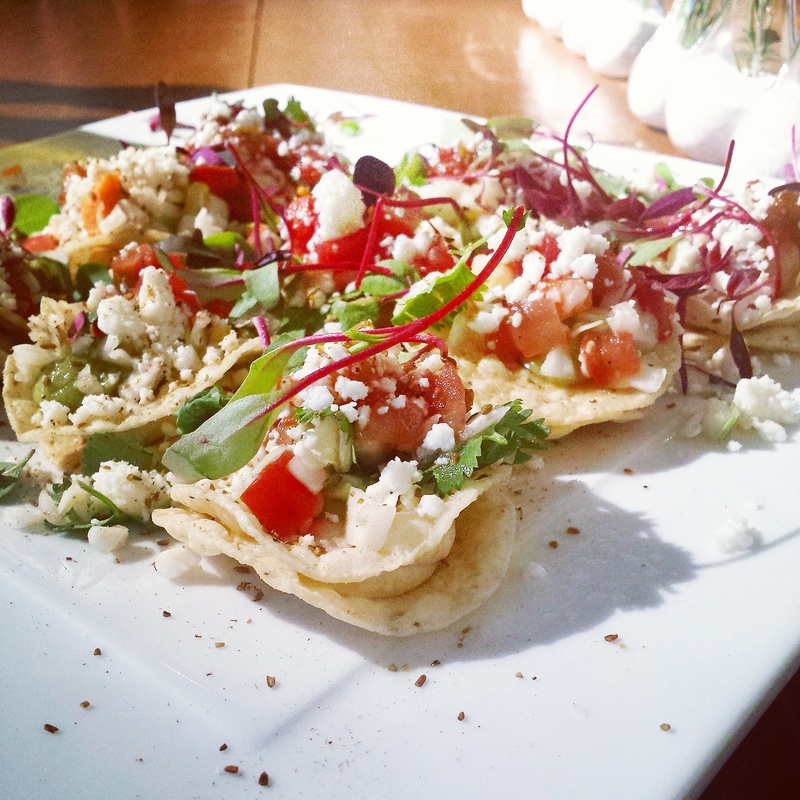 Global tostada: crisp corn tortillas layered with hummus, guacamole, cilantro lime slaw, pico de gallo and queso fresco. These were crisp, fresh and perfect two-bite appetizers. How fun will these be at a party? East Meets West sample of hummus: edamame, crystallized ginger & sesame oil; salty roasted pepitas & pumpkin seeds; 2Armadilos crispy rosemary roasted chickpeas & preserved lemon. When I saw the combination of edamame and crystallized ginger on the menu, I was confused. I could not figure out what that would taste like. Well, it tasted awesome. So definitely try it! A bit of sweetness, a bit of spice and the great bite from the edamame. If you aren't the adventurous type, you can get a classic hummus trio which includes olive oil, zatar spice and pine nuts; warm chickpeas & tahini; and garlic & lemon juice as the toppings. I also really liked the two vegetable platters: one had pickled radishes, beets and pickles, and the other had the sweetest tomatoes, crunchy cucumbers and red peppers. 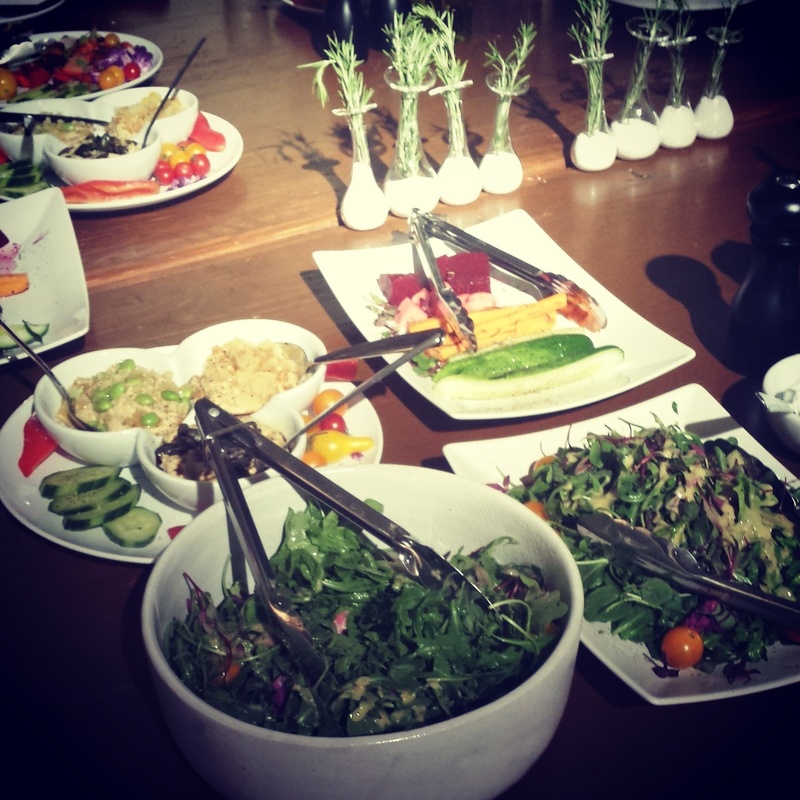 I cannot wait to come back and check out hummus Panini and the Green & Grains Salad drizzled with hummus vinaigrette. And, not only will you like the food, but you'll feel good knowing that Sabra is donating $25,000 to the National FFA Scholarship Program to support agricultural education!